Pacific Invasive Ant Key (PIAkey) - an illustrated identification guide to invasive ant species commonly encountered in the Pacific island region. The largest cause of extinction of single country endemic species in the Pacific is the impact of invasive species. Invasives also severely impact our economies, ability to trade, sustainable development, health, ecosystem services, and the resilience of our ecosystems to respond to natural disasters. A project designed to reduce the environmental, economic, and human health impacts of invasive alien species in both terrestrial and marine habitats in the Pacific region. Tye, A. (compiler). 2009. 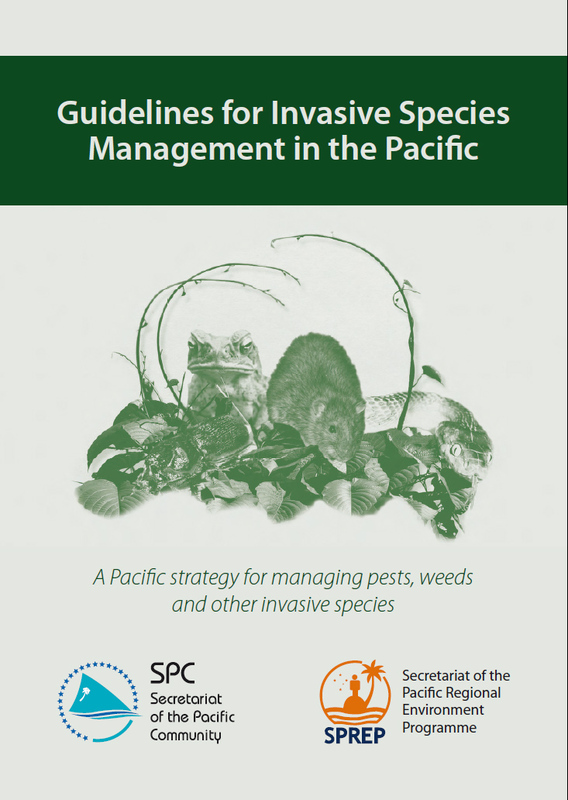 Guidelines for invasive species management in the Pacific: a Pacific strategy for managing pests, weeds and other invasive species. SPREP, Apia, Samoa. This document lists the essential components of a comprehensive and effective invasive species manage- ment programme. It has been compiled in consultation with Pacific island countries and territories, to support them in developing their invasive species work, and to guide regional and international agencies in providing assistance to them. Invasive Alien Species - Pacific is Birdlife International's major thrust to save Pacific island birds. This article in the New York Times referencing scholarly works discusses that not all invasives are bad, but underscores that is not necessarily the case in island ecosystems, so many of which are imperiled by invasives. Shirley, G (ed). 2000. Invasive Species in the Pacific: a technical review and draft regional strategy. SPREP, Apia, Samoa. A new 2015 publication “ Invasive alien species in aquatic environments. Practical information and management insights” is now available in English. The first volume presents the current situation concerning IAS management in French freshwater (scientific knowledge, legislation, stakeholders, management). The second volume is a collection of management experiments carried out in France and Europe. More than 60 managers have contributed and 26 species and 52 management experiments are described (objectives, protocols, results, costs, etc.). Marine invasive species—including marine algae, fish, invertebrates, and pathogens—are widely recognised as a major cause of marine biodiversity loss worldwide (Molnar et al. 2008). Marine invasive species are spread throughout the Pacific along a number of pathways, including commercial cargo, fishing and cruise ships, recreational boats and gear, and marine debris. Pacific Invasives Learning Network empowers effective invasive species management through a participant-driven network that meets priority needs, rapidly shares skills and resources, provides links to technical expertise, increases information exchange, and accelerates on-the-ground action. PILN serves teams of Pacific Island agencies responsible for invasives management, including agencies responsible for agriculture and natural resource management, international trade and border control, as well as environment and conservation. Pacific Invasives Partnership is the umbrella regional coordinating body for agencies working on invasive species (pests, weeds and diseases introduced from other places) in more than one country of the Pacific. Here you will find listings and descriptions of plant species that threaten ecosytems of the Pacific islands. Also listed are many other invasive and potentially invasive plant species present in and around the Pacific region. An invasive species is defined by the multi-agency National Invasive Species Council1 as one that is “1) non-native (or alien) to the ecosystem under consideration and 2) whose introduction causes or is likely to cause economic or environmental harm or harm to human health.” This position statement uses invasive species as an umbrella term referring to alien, exotic, nonindigenous, and non-native species. U.S. Department of Agriculture (USDA) provides links to resources in the Pacific Islands with an interest in the prevention, control, or eradication of invasive species. On February 18, 2016, the U.S. Department of the Interior released an interdepartmental frameowrk for the early detection and rapid response (EDRR) of invasive species--a coordinated set of actions to find and eradicate potential invasive species before they spread and cause harm.. The bedrock of the report is that the earlier you see the invasive and the quicker you respond then better the chances of eliminating the invasive species.